“With so many announcements of proposed changes to our immigration laws, it’s had a chilling effect on many immigrants," an immigration lawyer said. The San Francisco Bay Area couple — Andrew a research scientist and U.S. citizen, and Nang a journalism student from Myanmar — met online, became good friends and, in December 2016, married. Around a half-year later, they filed paperwork for Nang, now 30, to apply for a green card through their marriage, according to the couple’s attorney, Kalpana V. Peddibhotla. “It’s just emotionally straining, like we have no idea what was going on,” said Nang, who together with her husband spoke with NBC News about their case on the condition that only their first names be published out of fears of anti-immigrant sentiment. Nearly a year and three months later, Andrew and Nang finally got their green-card interview in San Francisco on Aug. 15, said Peddibhotla, who was with them that day. Peddibhotla, an attorney for nearly two decades who has practiced immigration law for 13 years, said Andrew and Nang’s wait time was longer than normal. “These cases are often interviewed many times around the six-month mark, but certainly before a year,” she said. Andrew and Nang are not the only ones experiencing delays. Other immigration attorneys in the U.S. have reported similar holdups in processing times, and not just for marriage-based green cards. Anastasia Tonello, president of the American Immigration Lawyers Association, said she believes Trump administration policy changes are responsible in part for fueling delays by creating more work for immigration officers. Among those changes is the phasing in of interviews for employment-based applicants who are filing to register for permanent residence or adjust their status. Bars said the agency received nearly 366,000 family-based green card applications in fiscal year 2017 — a nearly 34 percent increase from FY 2012 — which he said significantly exceeded agency projections. The number of adjudication officers, meanwhile, grew by 38 percent from 2012 to 2017, according to the USCIS. Data published on the USCIS website confirm that national processing times for some applications have indeed increased in recent years. This is true for the two that Andrew and Nang had to file for Nang to receive a green card: the I-130, used for petitioning an immediate relative, and the I-485, to register permanent residence or adjust status. From fiscal year 2014 to 2016, the time to process an I-130 actually dropped to 6 months, from 6.8 months, figures show. But it shot up to 7.7 months in fiscal year 2017, and to 9.6 months in fiscal year 2018, for which the data runs until June 30. Meanwhile, the national processing time for family-based green card applications (I-485) has nearly doubled since fiscal year 2014, from 5.7 to 10.9 months in 2018. USCIS said it decided to expand the types of cases requiring interviews after assessing how it uses in-person interviews to detect issues of national security while adjudicating cases. The agency said it will continue to add interviews and update business processes so that USCIS can interview all employment-based adjustment cases, around 130,000 annually. “USCIS is committed to adjudicating all petitions, applications and requests fairly, efficiently, and effectively on a case-by-case basis to determine if they meet all standards required under applicable law, policies and regulations,” Bars said. Nang came to the U.S. at the end of 2013 on a student visa to study media and communications. She said she graduated with an associate’s degree in journalism from De Anza College, in Cupertino, California, and later transferred to San Jose State University to finish a four-year degree. Nang had met Andrew, now 34, online in July 2015. The couple stayed friends for about a year before they began dating. “The moment I met him, I felt safe,” Nang recalled. The two tied the knot in December 2016, holding a small ceremony in Illinois with Andrew’s family. On May 30 of the following year, they filed their I-130 and I-485, the first step toward getting a green card, Peddibhotla said. Nang said they began collecting evidence, such as photos and documents showing that they lived together, to prove their marriage was legitimate. She also applied for temporary work authorization and “advanced parole,” which allows immigrants to legally leave the country while their green card applications are pending. Nang got those interim benefits last September, Peddibhotla said. But even with them, Nang had not returned to her native Myanmar, where she and Andrew wanted to have a wedding ceremony with her family. 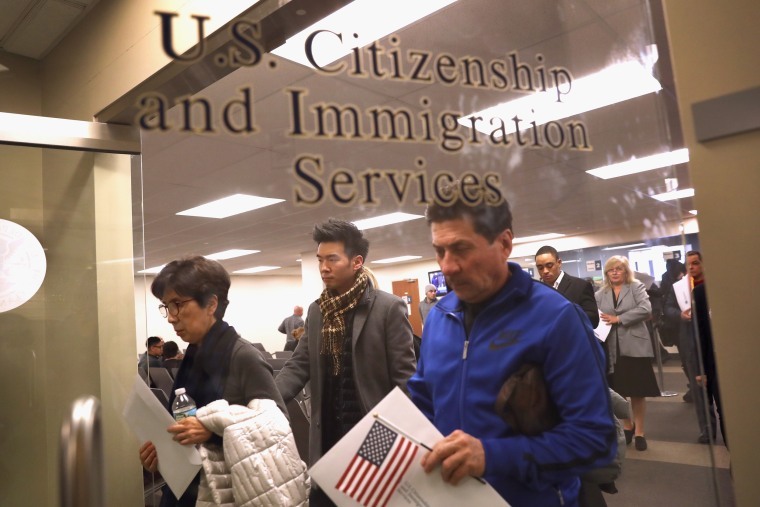 “With so many announcements of proposed changes to our immigration laws, it’s had a chilling effect on many immigrants, including Nang and her U.S. citizen petitioner, by not knowing whether the law is changing,” Peddibhotla said. To be sure, Peddibhotla said the law “hasn’t principally changed.” But the uncertainty, she said, has made immigrants unwilling to “take any action that might upset the apple cart,” like traveling outside the U.S., out of fear that they might not be allowed back in. At the San Francisco USCIS office, where Andrew and Nang interviewed in Aug. 15, the current processing time for a green card application was 10 to 17 months. Theirs took around 15 months. The interview itself lasted around 45 minutes. “The interview started on time, the interviewer was very professional and friendly, and I think everything went well,” Andrew said. Peddibhotla said last Monday that the government granted lawful permanent resident status to Nang on Aug. 20 and said she has received her green card. But Nang said that being a journalism student has made her want to speak out about the long wait she and Andrew experienced.